I think lots of readers would love it! I would love one with the Days of Future Past Saga! Marvel Masterworks Avengers Vol.17 contains 2 of my all-time favorite Avengers Sagas: The Nefaria Trilogy by Byrne and the Korvac Saga by Pérez and others with so many Avengers members! Also in stores today, the ALPHA FLIGHT OMNIBUS! On the subject of an X-MEN Artist's Edition -- can't happen unless Terry decides to release his share of the art. About the Alpha Flight Omnibus, Marvel could have also included Power Pack #9-10 that is a follow-up to MTU Annual #7 with Marrina. 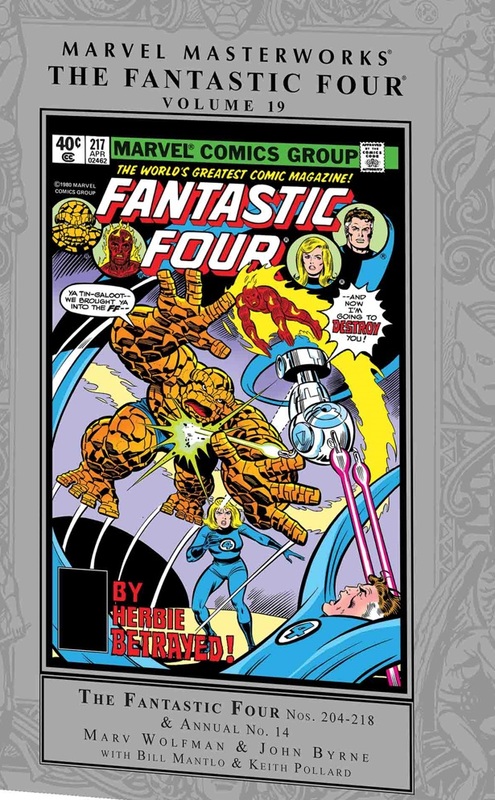 In their latest, greatest Marvel Masterworks, the Fantastic Four confront one of their oldest enemies: the Skrulls! And they’ll have to do it as their older selves after an aging weapon advances them to death’s door! The talents of Marv Wolfman, Keith Pollard and John Byrne — in his FF debut — keep the story feisty, the art spry and the adventure fantastic. How could it not be when the world-devourer Galactus enters the fray with a new herald? As if that weren’t enough, the cosmic Sphinx, scheming Monocle, combustible Blastaar, formidable Frightful Four and diabolical Salem’s Seven keep the scope epic, the stakes absolute and you on the edge of your seat! And H.E.R.B.I.E.? He’s just keeping it real. Collecting FANTASTIC FOUR (1961) #204-218 and ANNUAL #14. When a grief-stricken scientist attempts to recreate his dead son as a computer program, Wonder Woman inexplicably finds herself battling three powerful beings who are long dead! Princess Diana tries to piece together what's behind these miraculous resurrections, but the answer to their mysterious return might not be enough to save her from the onslaught of these deadly adversaries. This thread has been updated to include today's release of STAR TREK: NEW VISIONS - "Time Out of Joint"
This thread has been updated to include today's release of STAR TREK NEW VISIONS #17 - "All the Ages Frozen"
This thread has been updated to include today's release of STAR TREK NEW VISIONS #18 - "What Pain It is to Drown"
And also the fifth trade paperback collection! Collecting issues #12–14 and the short story that was previously only humble-bundled, "More of the Serpent Than the Dove." In “Swarm,” the Enterprise faces an alien threat that numbers in the millions; in “The Hidden Face,” a chance encounter with a drifting ship leads the crew to a world where the most obscene thing imaginable is the human face; and in “Sam,” Captain Kirk must face one of the greatest moral challenges of his life, proving the innocence of a confessed killer–Sam, his own brother! In about 2 years we'll get the the beginning of Byrne era as total author in the Masterworks! 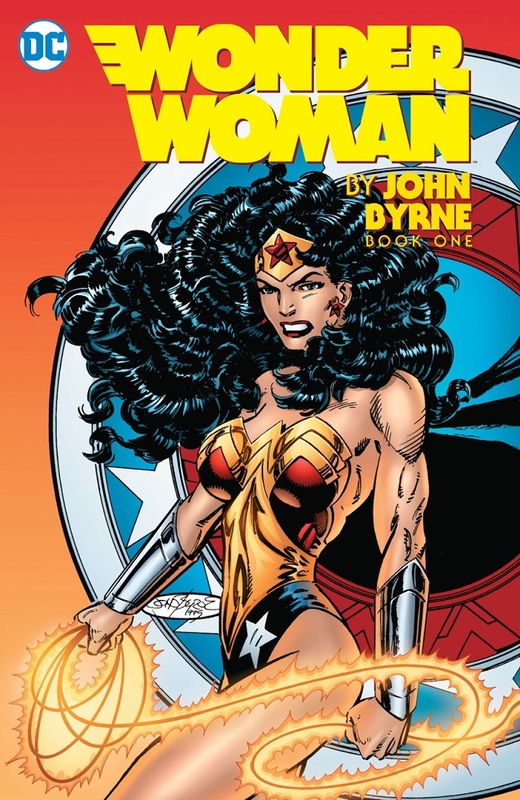 Legendary writer/artist John Byrne brought his unique vision to the DC Universe over his decades-long career. Rediscover his classic stories from BATMAN: GOTHAM KNIGHTS #2, CHRISTMAS WITH THE SUPER HEROES #2, DC COMICS PRESENTS: HAWKMAN #1, DCU INFINITE HOLIDAY SPECIAL #1, THE FLASH 80-PAGE GIANT #1, GREEN LANTERN ANNUAL #3, GREEN LANTERN: GANTHET'S TALE #1, NEW TEEN TITANS ANNUAL #2, OUTSIDERS #11, THE POWER OF THE ATOM #6, SECRET ORIGINS ANNUAL #1 and more! This thread has been updated to include the release of STAR TREK: NEW VISIONS #20 - "Isolation"
Hmmm - the link doesn´t work - And I´m not allowed to edit my post ?? This thread has been updated to include today's release of JB's STAR TREK: NEW VISIONS #21 - "The Enemy of My Enemy"
This thread has been updated to include today's release of STOWAWAY TO THE STARS - Special Edition. Full-color splash pages and a new accompanying prose story by JB! Vivid and spacey colors by Leonard O'Grady! Early JB work being reprinted.